Austin, Texas — Austin-based pavement engineering firm The Transtec Group provided pavement design expertise to Flatiron-Dragados, LLC regarding the new Harbor Bridge project in Corpus Christi, Texas. The Texas Department of Transportation (TxDOT) determined that US 181 and the Harbor Bridge needed to be improved in order to maintain a safe and efficient transportation corridor. The existing bridge had safety issues associated with the lack of shoulders, steep grade, a reverse curve, and an accident rate that was higher than the statewide average. Corpus Christi is one of the largest ports in the U.S., docking tens of millions of tons annually. The bridge’s 138 feet of navigational clearance, which met World War II standards decades ago, needed to be enlarged to accommodate modern ships. 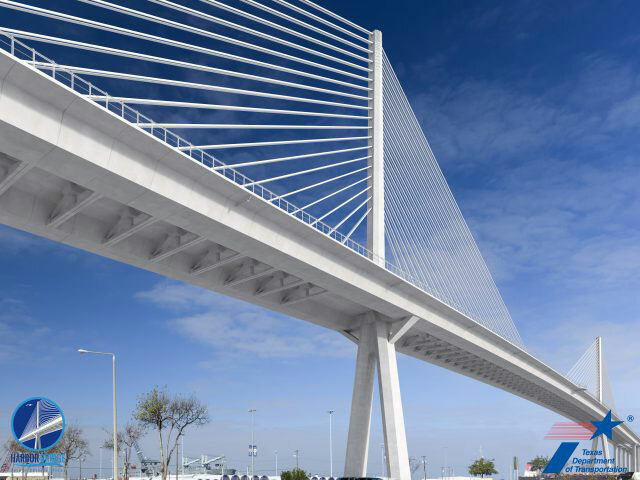 A new bridge would enable TxDOT to improve both safety and transportation, meeting traffic demands and broadening economic development opportunities for the Port of Corpus Christi. The design-build project includes replacement of the existing Harbor Bridge and reconstruction of portions of US 181, I-37, and the Crosstown Expressway — a total of 6.44 miles of bridge and connecting roadway. The bridge will include six-lane sections of US 181; three lanes in each direction with a median barrier, shoulders, and a bicycle and pedestrian shared-use path. Additionally, the project includes the reconstruction of approximately 1.6 miles of I-37, reconstruction of approximately 1 mile of the Crosstown Expressway, and demolition of the existing Harbor Bridge. This approximately $1 billion bridge project also has 8 miles of new and rehabilitated pavement for the main lanes, frontage roads and city streets. The Texas Department of Transportation determined that US 181 and the Harbor Bridge needed to be improved in order to maintain a safe and efficient transportation corridor. As is common on design-build projects, the developer is most interested in reducing upfront costs while simultaneously meeting TxDOT requirements. It was important for Transtec to produce effective design plans in a timely manner that suited the needs of both the developer and TxDOT. After presenting multiple options for the pavement design with various risk and reward factors, asphalt was the final recommendation and the proposal was approved. Transtec optimized meeting time by coming to the table prepared with the right answer and a proper model for design. Eliminating the need to research, back-check, and schedule excessive follow-up meetings expedited the process and proved to be cost-effective. Transtec’s previous local experience and knowledge with pavement design resulted in cost-effective designs, incorporating previous experience from past design-build projects like the nearby US 77 Kingsville to Driscoll project in Texas. “We could not be more pleased with their performance on this project and look forward to working with The Transtec Group in the future,” said Bacon.